We are specialized in IT Park Consultancy. 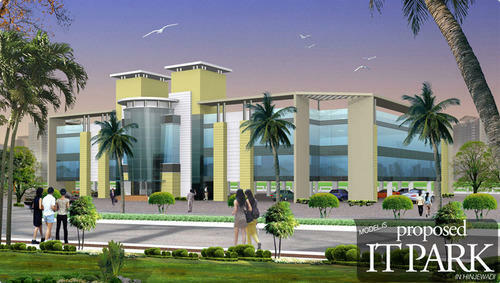 IT park is basically construction unit which will be used by MNCs technical men or business men for the development of technology based on computer related products, telecommunication products, robotic products etc. This park fundamentally divided in four parts basic, IT industries and IT enabled services, commercial complexes, residential complexes, facilities area. "KAT" is one of the leading Industrial Consultancy Organization, specialising in 100% Buy-Back Arrangements, Foreign Collaboration & Preparation of Project Reports/Detailed Techno-Economic Feasibility Reports for High-Tech and 100% EOU/EOU Projects. Our other specialised services include Project Planning, Preliminary Consultancy, Turn-Key Services, Public Issues, Technology Transfer etc. Our Most modern data-base comprises (1) In-House Computers, to provide up-to-date information, (2) Computerised Data Bank & Library, Equipped with latest Reference Books, Journals and Govt. Circulars etc., (3) An Expert Team of Engineers, Consultants, Technocrats and Market Study Experts, (4) Over 40,000 Project Reports on various items in ready stock, (5) Thousands of satisfied clients (Indians as well as Overseas) and years of vast experience in the field. Whole some industrial Consultancy is a complex activity, which must be supported, with all the relevant & authentic information. This essentially reflects in our each and every Detailed Project Report.